The youth uprising in Kisangani has been fueled by the taking over by M23 of the city of Goma. Kisangani is a town in Orientale Province, right about North Kivu where Goma is the capital. Since Saturday last week, the people in Kisangani are living with no electricity and no water. The population was already planning to protest against this ongoing problem. After meetings, they decided to plan a rally today and because of the situation in Goma, tension grew among the protesters. What is going on in Kisangani? 1. PPRD office in the commune of Makiso has been set on fire. PPRD is the acronym of Congolese president Kabila's party. 2. A fire truck sent to put down the fire at the PPRD office has been set on fire by the protesters just right in front of that office. 3. The provincial office has been set on fire also. 4. Two MONUSCO offices (UN) have been set on fire. a. The one near ONATRA has been ransacked and some parts set on fire. The guard outposts have been burned down. The entrance of the compound have been destroyed.To protect it now, they have put a trailer truck at the entrance so no more protesters come in. b. the other near the old Mobutu house by the Congo river (in the Ex Amis Congo neighborhood) also was ransacked. People are throwing stones at that UN compound. 5. Provincial parliament building was attacked but the police is protecting it and using live bullets to disperse the protesters. 6. A church was also burned down. It is called Eglise JSS. It is located in Kabondo on 13th avenue. The founder of the church is called Jean Marie Runiga. If you have been watching the M23 news, you probably know that he left Kisangani to go join the rebels since early July. Read here! 7. CENI office has been set on fire too. CENI is the electoral commission in Congo. The police, army, and republican guards are now around it to protect it. 8. The house of the former governor of Oriental Province has been set on fire too. 9. 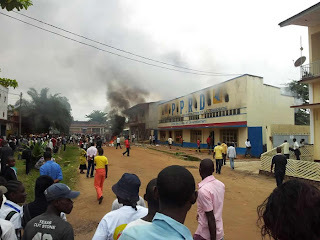 A shop called Alimentation FOCAD in Rond Point SGA was also set on fire. The owner of this store is the current chief of staff of the ground forces of the Congolese army. Neighboring stores caught on fire and the whole side is burning. 10. IBTP (university) students in Kisangani are fighting the police as officers circled them so that they could not join the other protesters. Click here to support the Congolese youth inside the DRC. Contact @Kambale on Twitter for updates.